Here we go again! Straight off the bat, I’m not happy with the amount of spoilers on the box. I really wish there would be more of a surprise! Maybe next year. Sure, the cover looks great, but it’s too busy, and filled with spoilers. The display stand looks great this year! A balcony and path, with a rug, fireplace and train set. It looks great. For me this is the best box art so far. Let’s dive in! 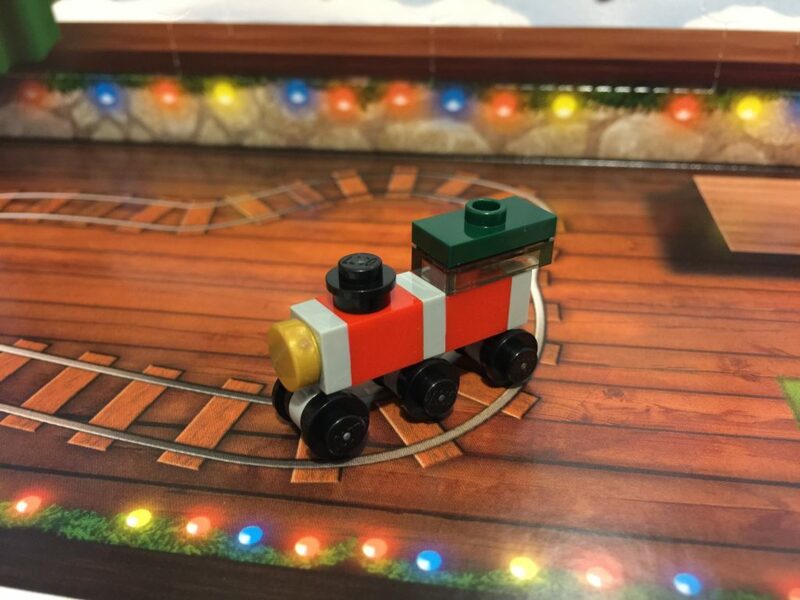 We kick off the City Advent calendar with a cute little train! I’m impressed so far! We’ve started well. It’s easily recognisable (albeit with some odd spacing in the wheels), and simple to build. Nothing overly special parts-wise here, although I do like the dark green jumper plate. The minifigure scale toys are a favourite feature for me with this calendar. I really hope there’s more good ones. 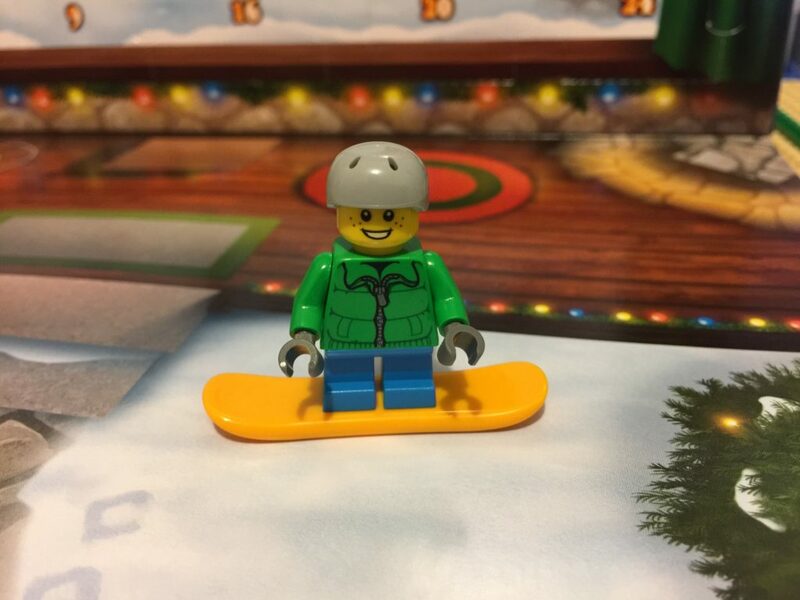 Our first minifigure is a snowboarding kid! He’s probably the owner of the train too. I love the helmet inclusion, and his outfit is great, with a green puffer jacket, blue pants and grey gloves. The snowboard hasn’t been seen much in this colour, with only four other sets including it. This build is simple, and will be fun for the kids. Christmas in Australia is warm, so I honestly don’t associate fireplaces with Christmas (not snowboarding either), but in many other places, it certainly is, so this is a good inclusion. I like the shape and use of parts, and the railing is clever at the top, but I’d love to see something hanging off it! It needs a tiny stocking for a bit of colour. It also has the perfect spot on the display stand, with a neat 2×4 plate size marking. I’m not sure about this build. I’m assuming it’s meant to be a side table, but it’s just too small. The lamp is cute, and the mini Christmas tree is cute but as a whole it looks a little off to me. Maybe a bigger chair and table, but that would mean more pieces in a very small compartment. Today’s build is a brilliant and simple little gingerbread house! I think it’s fantastic. 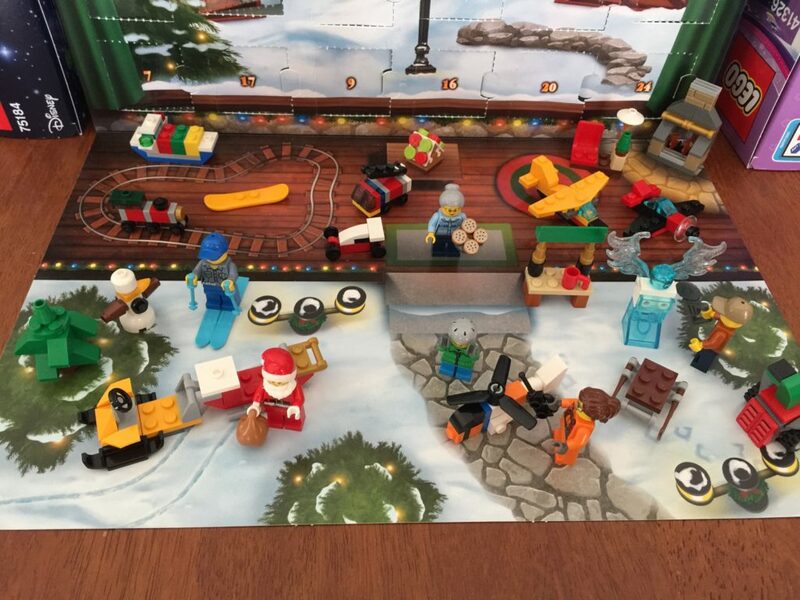 The nougat rocker bearings have only been seen in 70904 Clayface Splat Attack, so are quite rare. The space under the rocker plates is a little unsightly, but isn’t a big detriment to the model. 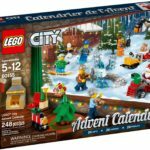 The City Advent Calendar is looking good so far! I absolutely love Day 6’s model! 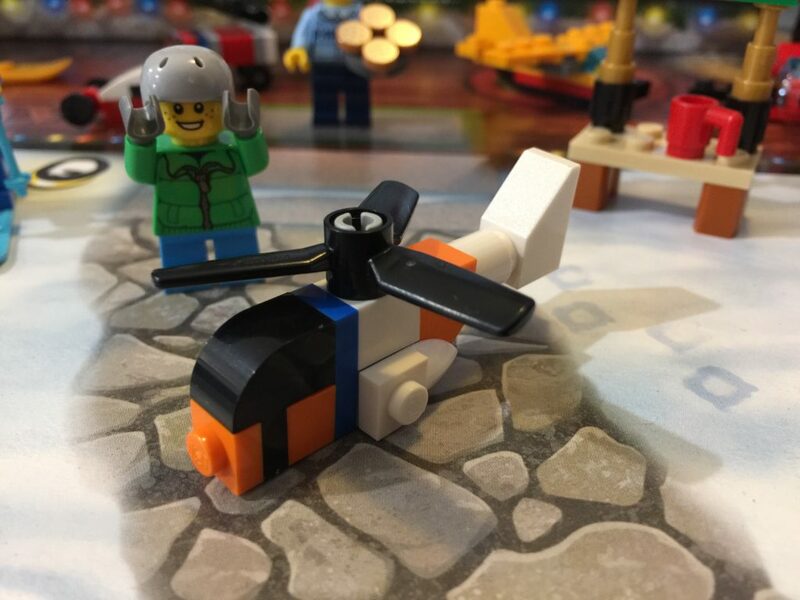 This amazing little plane looks fantastic, and has some interesting techniques used for the fuselage – Erling bricks! The use of a transparent radar dish as a spinning propeller is inspired. I am really impressed with this one. 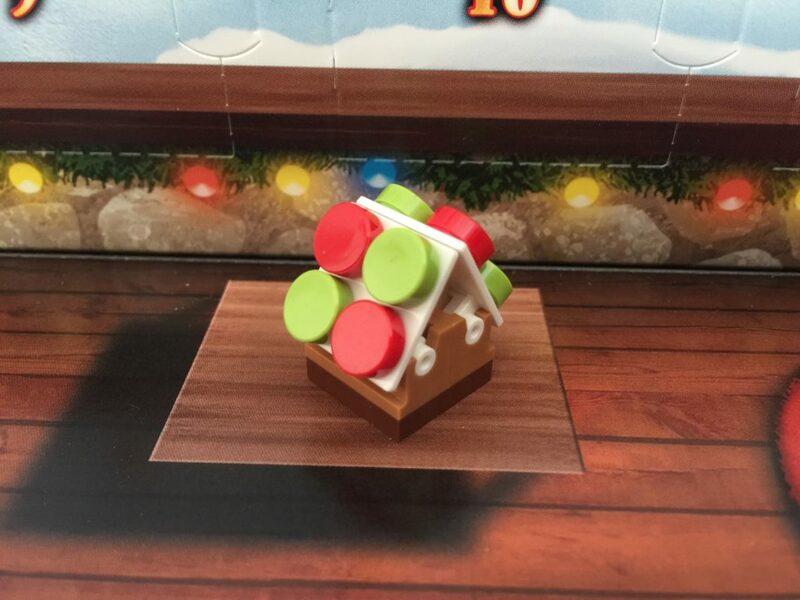 One of the aspects I love about the Advent Calendars is the parts. City always seems to have a healthy dose of hockey sticks! Today we get two brown sticks, as a part of this sled. What’s good about this is that this is the first time we’ve seen brown hockey sticks! Previously they’ve been white. The boy seems pretty happy to have something to do aside from snowboarding. It’s a very simple build, but is effective. To me the sled is a little thick, but it works. 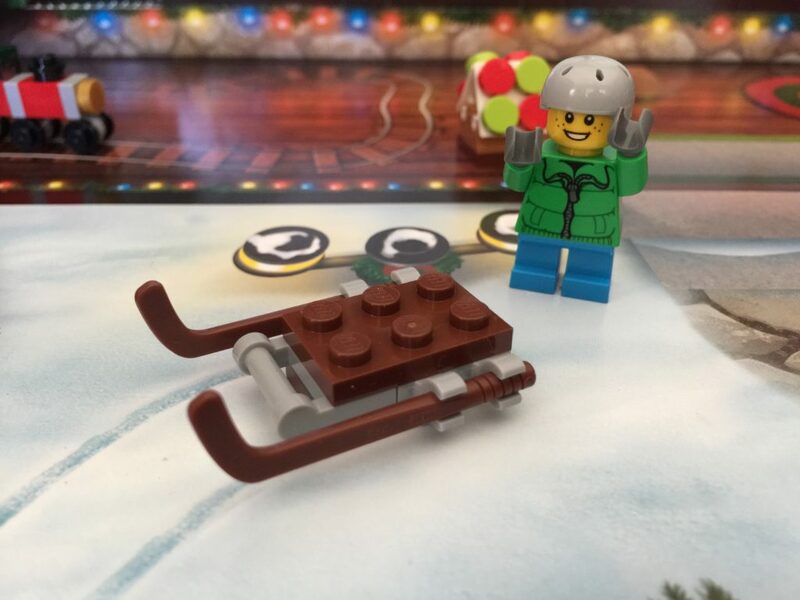 It’s the second minifigure for the 2017 City Advent Calendar, with an adult represented! 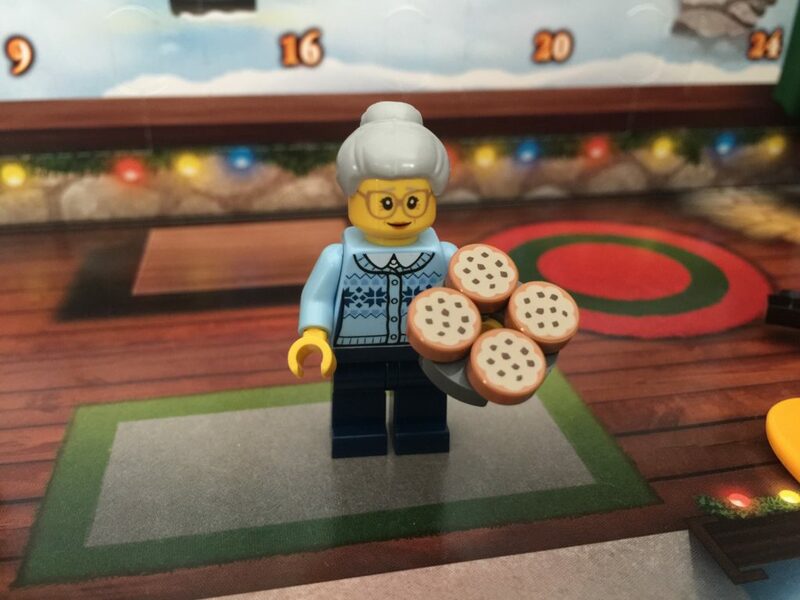 Grandma’s been busy baking cookies, and they looks pretty tasty! It’s great getting another senior citizen. They’re not strongly represented in my collection, or in general as far as I know, and the blue Christmas cardigan is fantastic. It’s only been seen in three other sets, so is still quite rare. Plus, you can never have too many cookies! Here’s one we don’t see often in Oz – a snowblower! It’s fantastic, and is not one we’ve ever seen in a calendar. 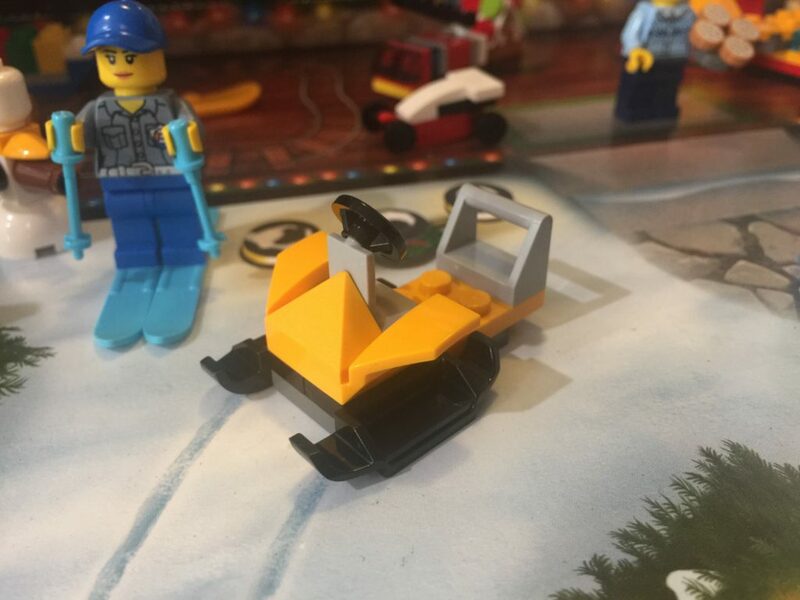 It’s able to be driven by a minifigure and is perfect for keeping the path clear of snow. I love it! Another plane! Brilliant! I’m absolutely loving the City set this year. 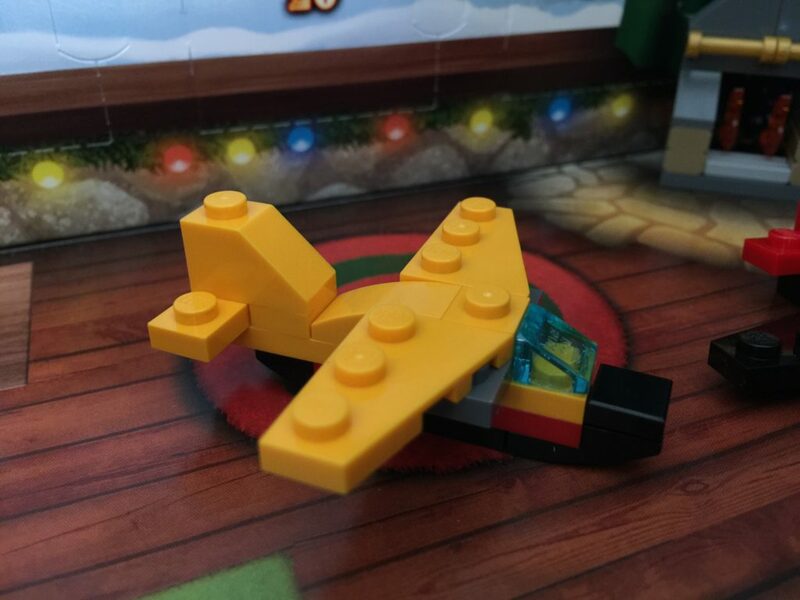 There are some awesome builds included, and we get two planes! I reckon this is a sea plane, with the black hull. The shape is excellent, although I’m not sure about the dark grey 2×3 plate under the wings. That’s the only thing that’s letting it down. The rest is spot on. Bright colouring, and the little pop of red under the cockpit breaks it up slightly. I’m pumped for Day 11 now! Every year in the City Advent Calendar we get a snowman. They come in all shapes and sizes and it looks like this version has been to the gym! Those arms are comically large. Aside from that, I really like him! We’ve hit the halfway mark, and to celebrate this, we’ve got a coffee stand…I think. 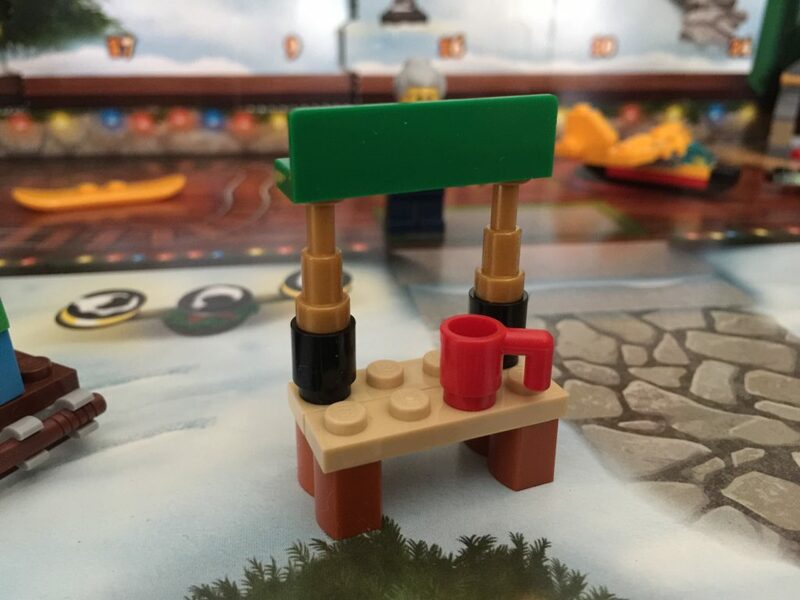 It’s a stand with a mug (which I’m assuming is for Santa), but no cookies! Santa’s not going to be happy. It’s very simple, and is topped off with a brand new part! These 1x4x1 wall panel elements are everywhere, in a plethora of colours, and now we’ve got dark green. 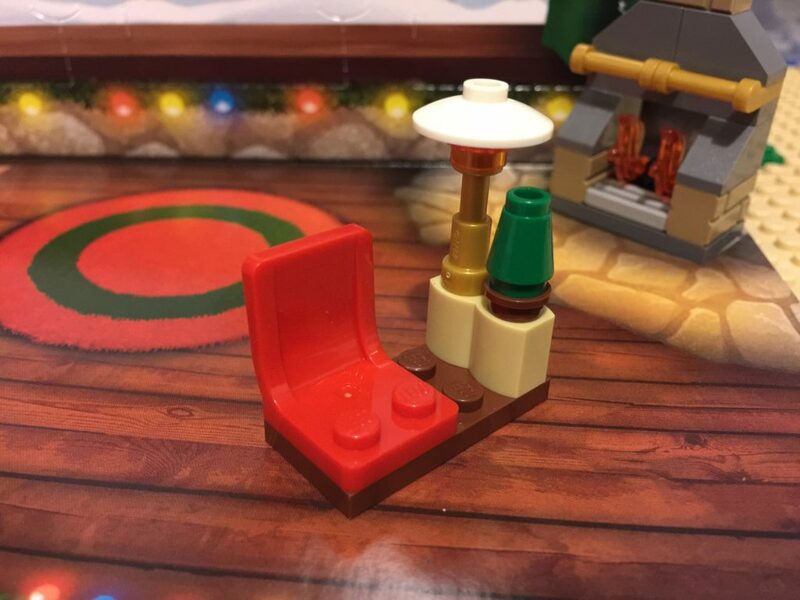 This is the only set that has them, but I’m predicting they’ll be in other sets very soon. Either way – new part! Hooray! 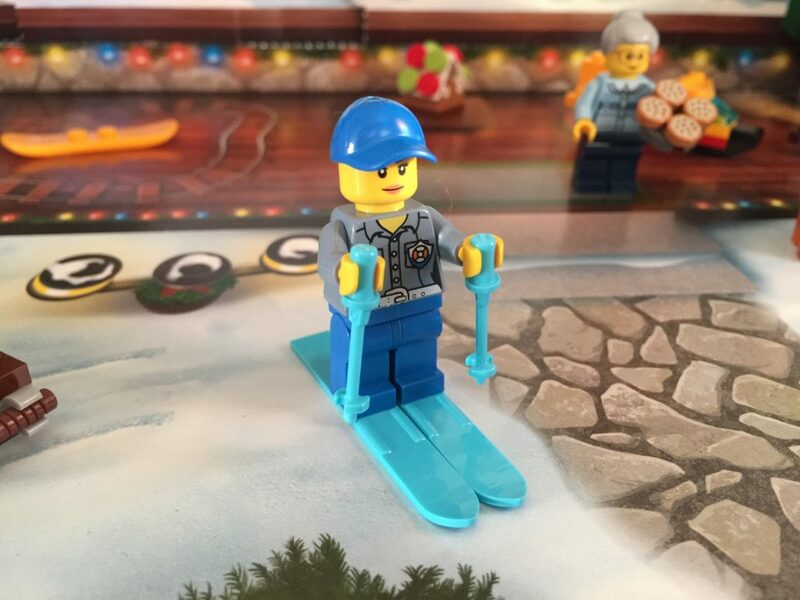 While I understand the choice of sports accessories, I don’t get why the minifigure is a coastguard. 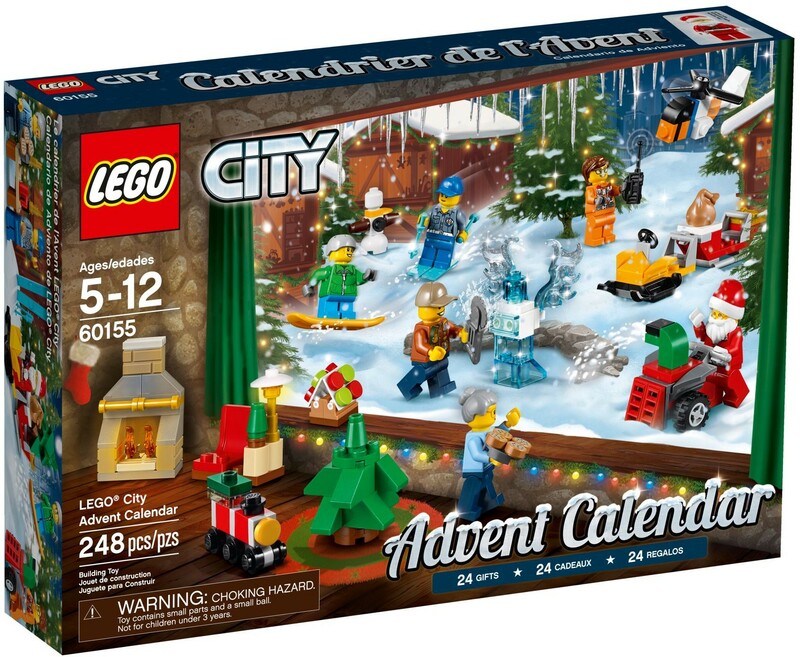 It’s a tie in to the new subtheme of CITY, but it’s still an odd choice for Advent Calendar. The uniform is ok, but there’s a clear missing link with the pants. There should be printing there, in my opinion. We get another model toy today, and it’s a cute little cargo ship! I reckon this is fantastic. The shape is fantastic, and the colours too, but I would suggest one change. Instead of using three 1×2 bricks, I would make the scale of the cargo suit the scale of the overall build, and use 1×1 plates instead, with tiles on top. Aside from that though, I love this little thing! Following on from yesterday’s microscale toy, we get another one today – a fire truck! As soon as I saw this build, I immediately thought it looked like 60061 Airport Fire Truck, only with a ladder. I am really impressed with this year’s City calendar. It’s a lot of fun and has some great builds included. The colours of this model are spot on. 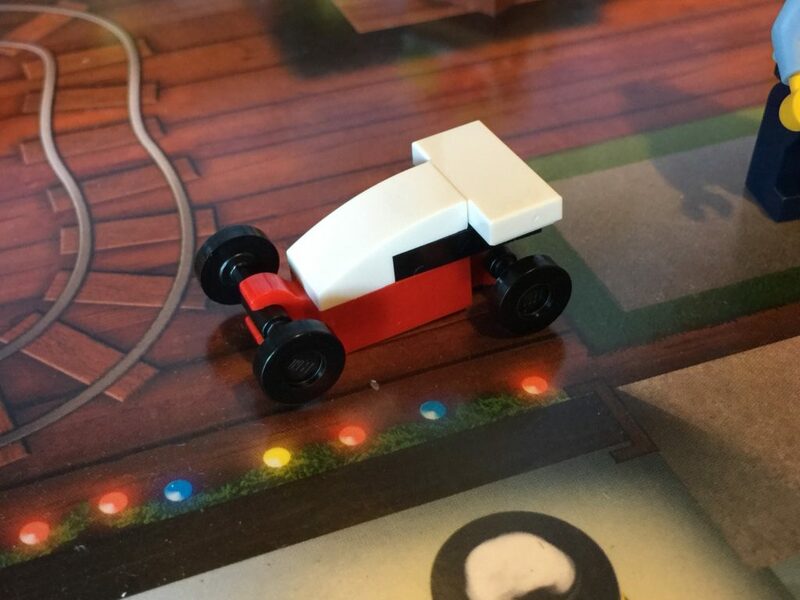 My wife thought this was a very clever little build and so did I! I’m very excited about tomorrow. We’ve had a good run so far! Continuing on from the last two days of model toys, today we get a little race car. It’s very simple, and quite effective. It’s made of two 1×2 red plates with clips as the chassis. 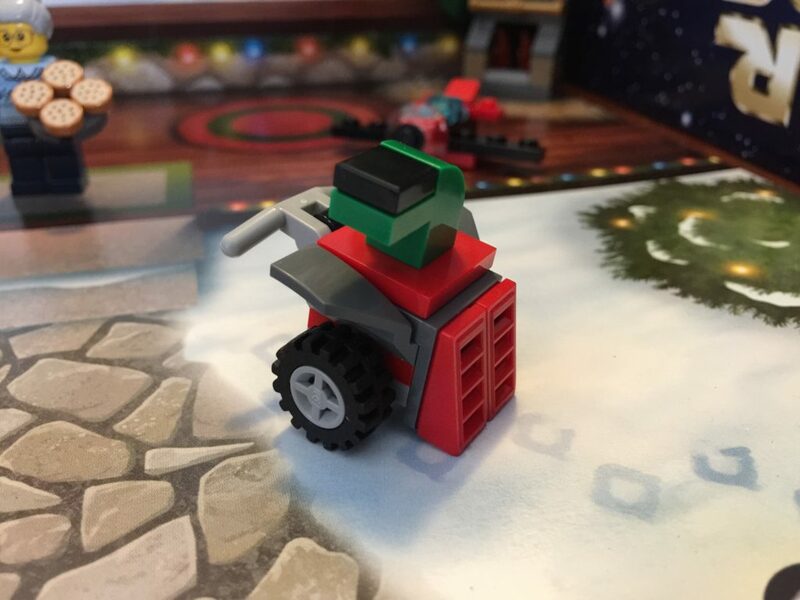 The only thing I’d change is that the bottom red clip is slightly too long, so it causes the front wheels to lift off the ground. That’s it. I reckon it’s very cute! We get our seventh model toy today, which I think is great for this set. It’s a model helicopter, with the colourings of the Coastguard unit. It’s simple enough to put together, but aside from the rotor, utilises 100% SNOT technique. It’s a very clever build, and one I’ll remember for other projects. 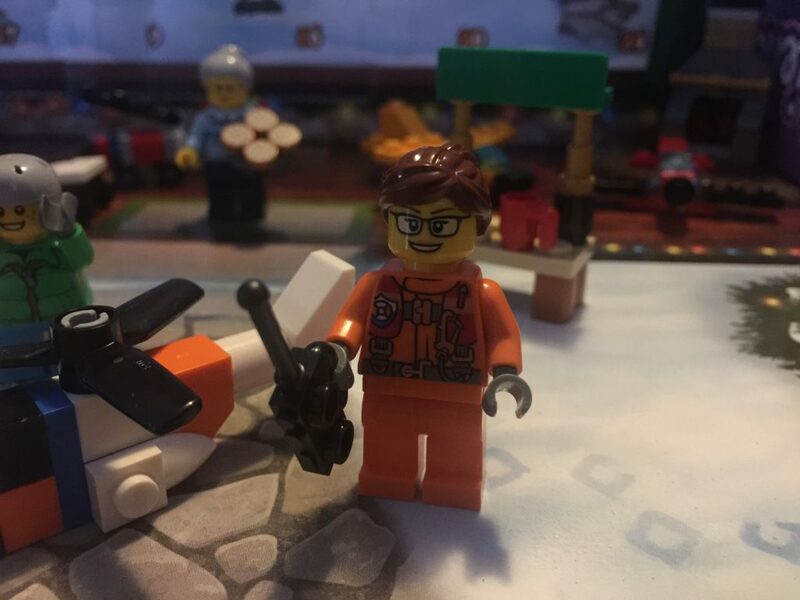 It’s another minifigure today and once again it’s from the Coastguard sub-theme of City. 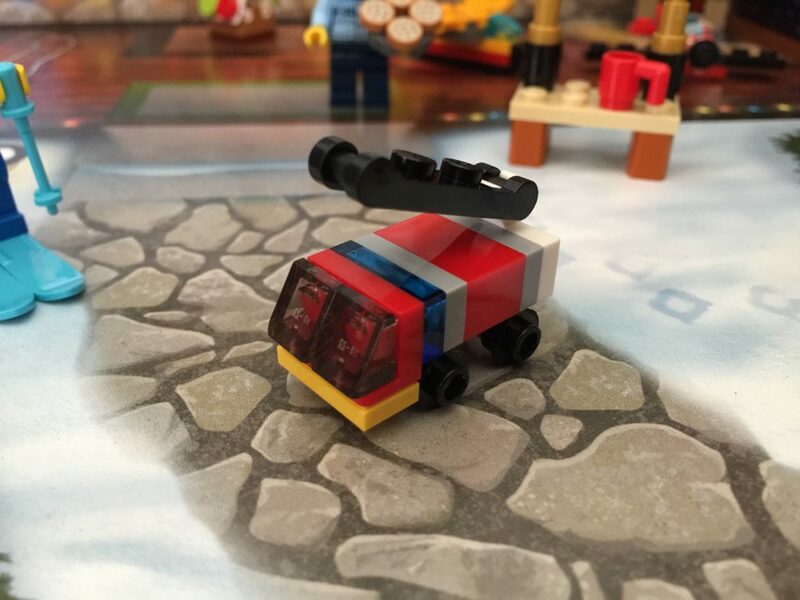 This torso has only been seen in four of the six Coastguard sets from this year, so it’s not exactly rare. 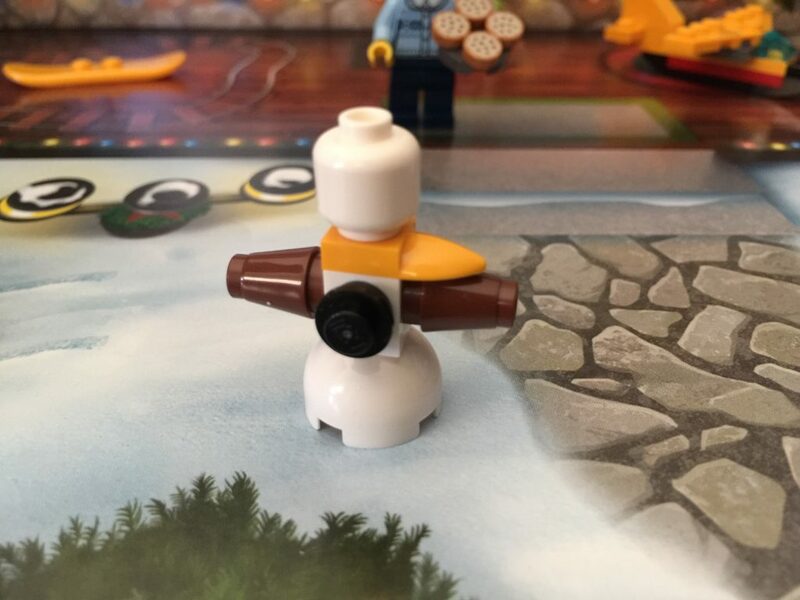 Like our last Coastguard uniformed minifigure, I feel it’s an unfinished print. There should be printing on the legs as well. The worker comes with a radio, and is another female. So far we’ve had a kid and three female adults. I wonder if there’ll be a man in the collection (apart from the big red guy)? This is apparently a Christmas tree, but it’s decidedly bare. 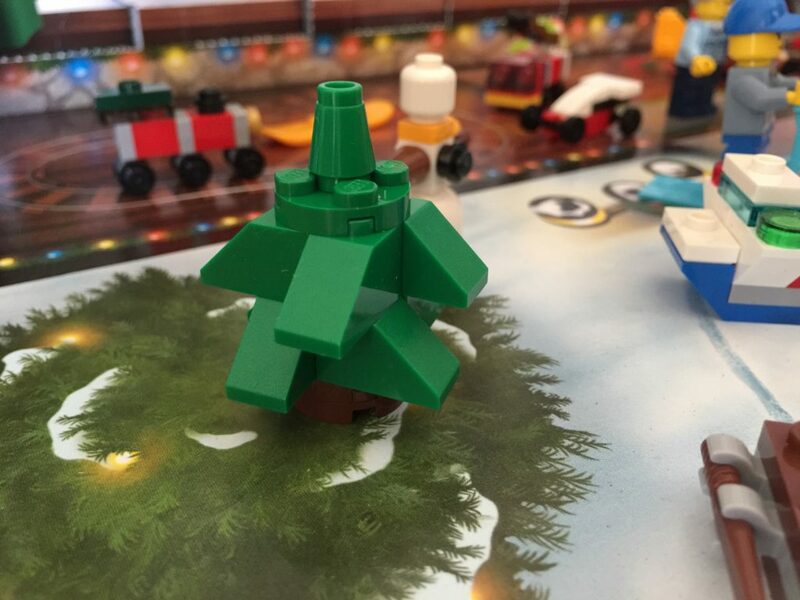 These tree designs are pretty much the same each year, however this is lacking the longer leaves at the base – using a 1×3 green roof slope would have been better. I reckon this is just a regular pine tree, rather than a Christmas tree. If it was a Christmas tree, it’d need decorations and a star! Maybe that comes tomorrow? If so, that’d be very disappointing for a day’s build. 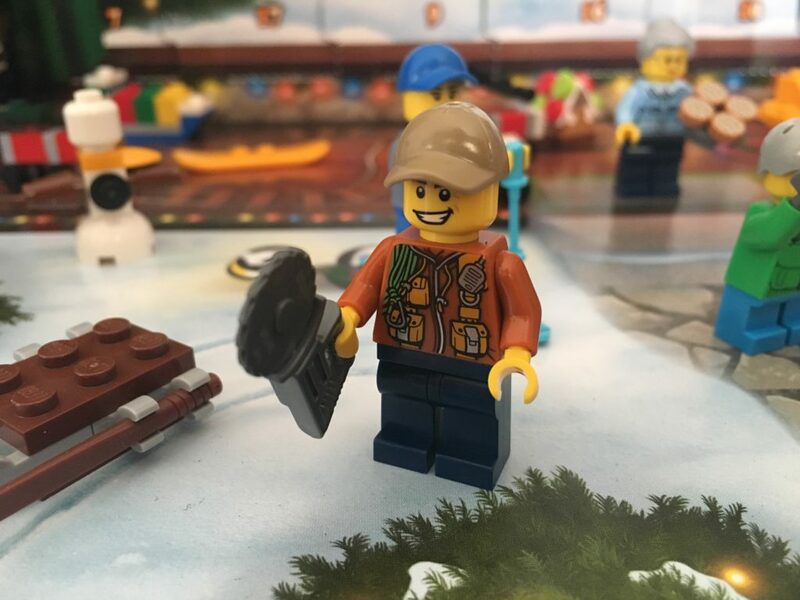 We’ve got our first adult male minifigure in the set with a Jungle Explorer. I haven’t got any of these sets yet, so it’s nice to have a new design minifigure! His printing is quite nice and he comes with a big circular saw in his hand. Not too bad. Four days left! 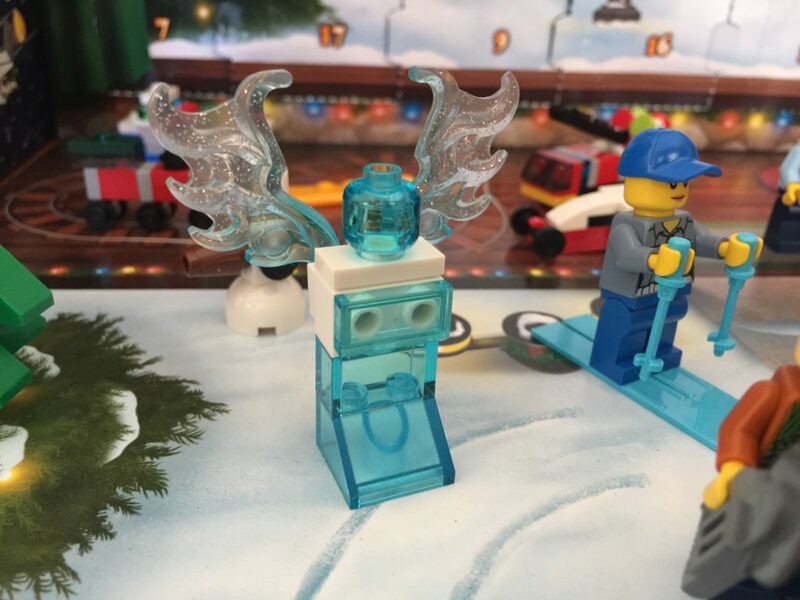 Today’s build is a rather unique one – I really like this ice sculpture! Those wings are beautiful and a definite new part for me. They’ve got some glittery-ness to them, which my wife liked as well. They’re not unique to this set, as they’ve been around since last year, in a couple of Juniors sets, and Disney sets, with Frozen as the main taker for this part. It’s a shame the ice sculpture doesn’t have arms. 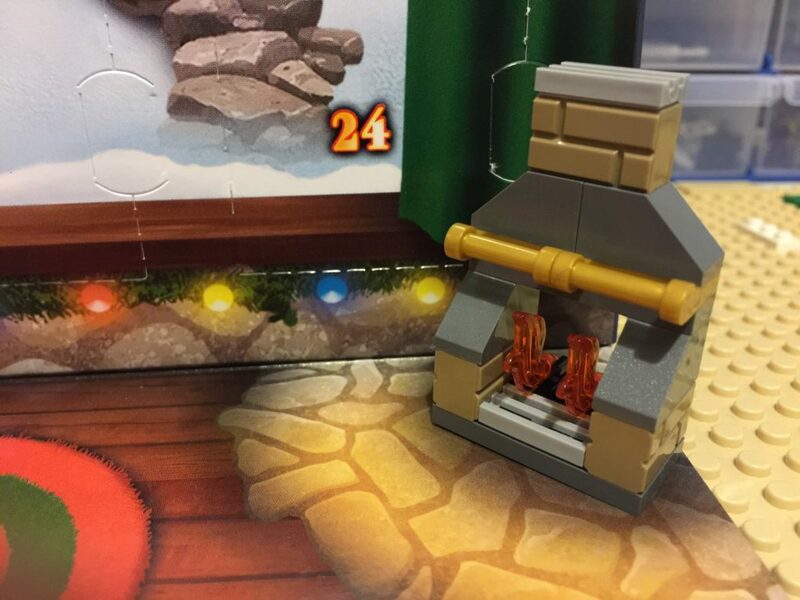 It would have been great to have those, but as far as Advent Calendar inclusions go, this is a good one. 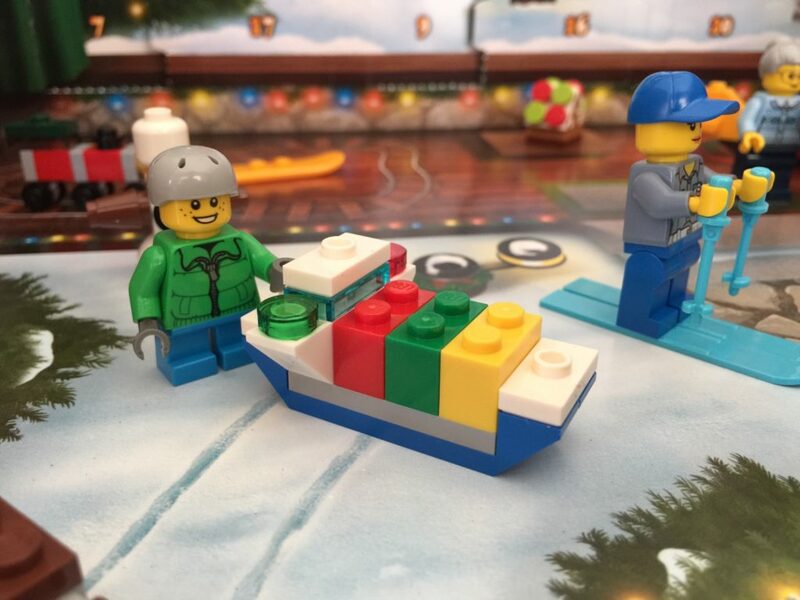 We’re fast nearing the end of our Advent Calendar fun for the year, and Day 22 is revealed as a yellow snowmobile. It looks good, albeit missing the caterpillar track at the back. This would have been a little tricky to achieve at this scale, but certainly not impossible, given the parts we have available today. The rarer parts included in this build are both yellow – the 1×2 roof capping end tile, and the 2×4 wheel arch. 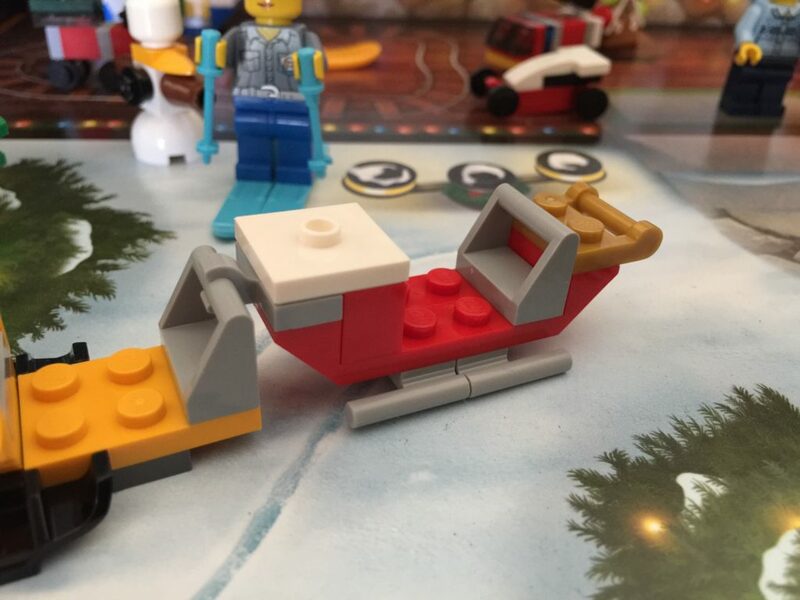 It’s the second last day of the calendar, and as is tradition, we get a sleigh for Santa. I really like this one. It’s iconic in it’s design and the addition of the gold 1×2 plate with bar is a nice touch. I’m guessing it’s towed around by yesterday’s snowmobile. No guesses for what’s coming tomorrow! 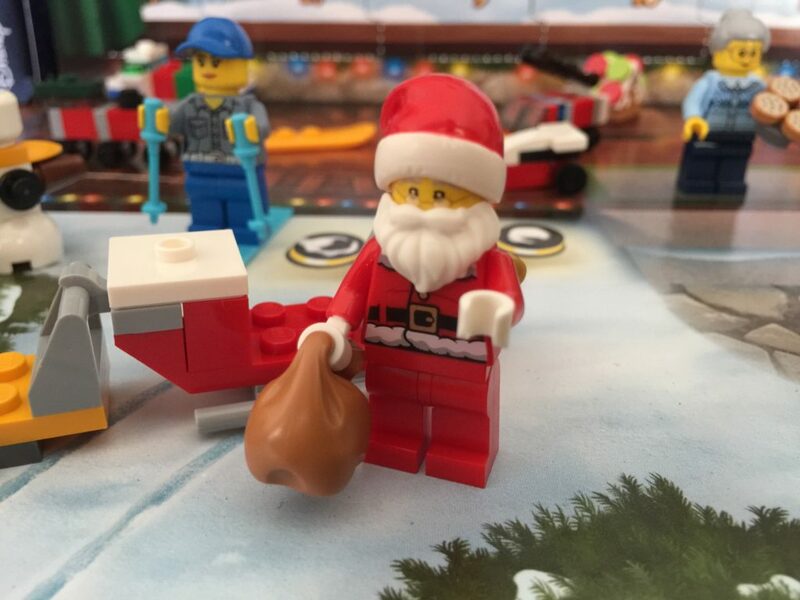 It’s Christmas Eve, and the last day of our Advent Calendar adventure, so that means one thing – Santa! This one is extra special, as it’s a brand new torso, and a new(ish) head! I didn’t get a photo, but the back shows Santa sneaking a candy cane in his belt. It’s very cute. I love this head. It’s incredibly versatile and comes complete with glasses! I love it. It’s excellent. 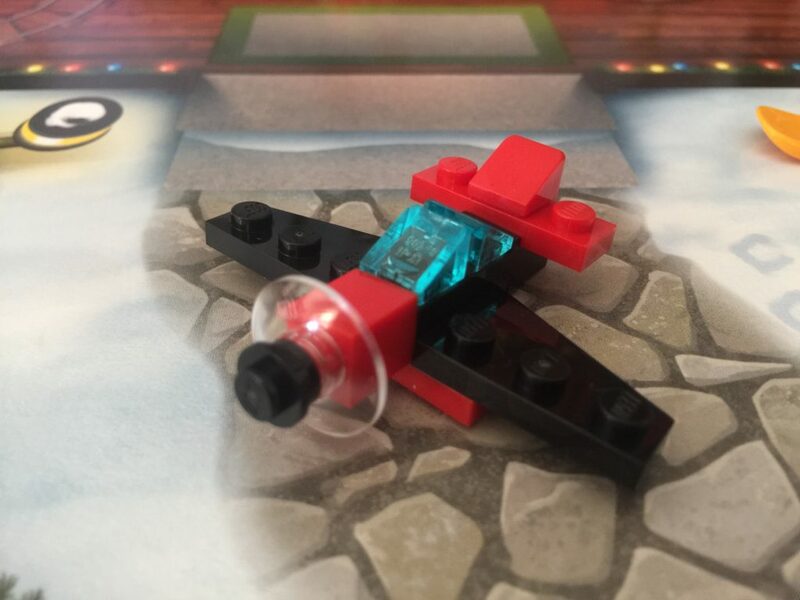 It also appeared in 60153 Fun at the Park, which I’m yet to get. As always, Santa’s got his sack with him. It’s a good way to finish off this calendar. That’s it! That’s a wrap (or is it an unwrap?) 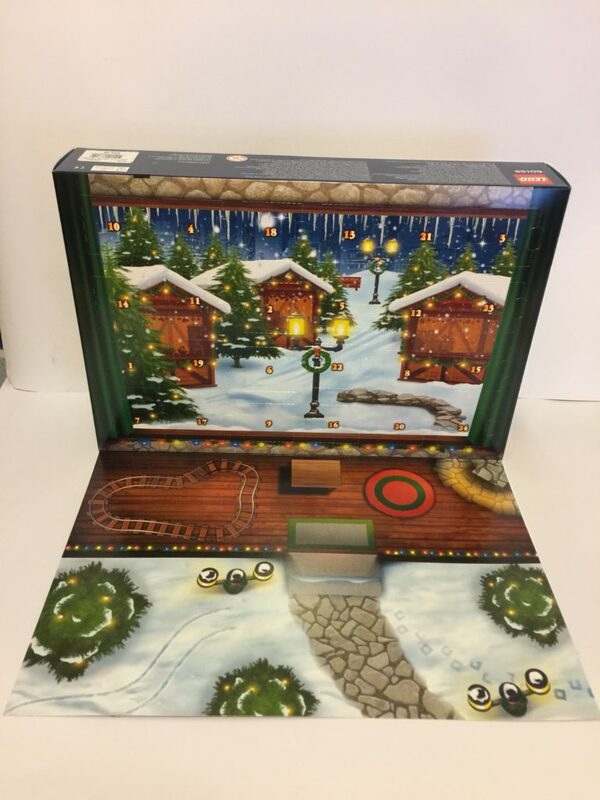 on the 2017 City Advent Calendar. It’s been another excellent calendar, with six minifigures, a whopping eight toy models, plus more. The best model for me would be Day 6’s aeroplane, with the worst being the very bare tree. What were your best and worst? Let me know in a comment below.